In a hungry post-work-mad-dash, I searched the wonderful world wide web for a classic chicken dish. 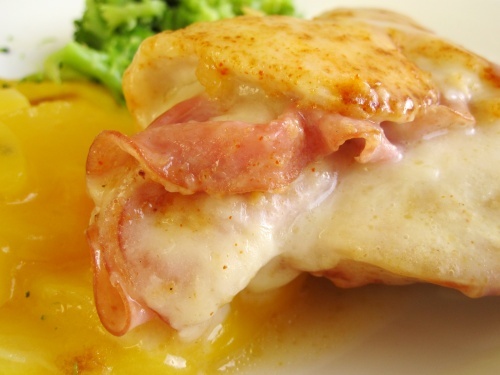 I stumbled upon this little diddy and realized I have never had real chicken cordon bleu, much less cooked it. I admit that my favorite chicken recipes always include it being stuffed with something or wrapped inside something else, or both. Or covered. Or smothered. And the list goes on (literally, I have a list right here of all these chicken recipes I need to post). So as the first chicken post, I begin with a classic. The sauce is simple and creamy—and in this picture blends in with the potatoes au gratin to form a mirage of creamy, cheesy goodness. *I followed this recipe, but just bought 4 thin sliced chicken filets and stuffed it with the amount of ham and cheese I found satisfying. Play around with the portions, and don’t sweat if you can’t find a package of 6 chicken breast halves—they don’t sell them that way usually. Pound chicken breasts if they are thick. Place a cheese and ham slice on each breast. Roll up the chicken and pin with a toothpick. Mix the flour and paprika in a small bowl, and coat the chicken pieces. Heat the butter in a large skillet over medium-high heat, and cook the chicken until browned on all sides. Add the wine and bouillon. Reduce heat to low, cover, and simmer for 30 minutes, until chicken is no longer pink and juices run clear. Remove the toothpicks and transfer the breasts to a warm platter that is deep enough to hold the sauce. Blend the cornstarch with the cream in a small bowl, and whisk slowly into a clean skillet over medium-low heat. Cook, stirring until thickened, and pour sauce over the chicken. Previous Previous post: my my my, my key lime pie!